Bundesliga | Borussia Dortmund vs. Bayern Munich: Vote for YOUR Klassiker dream team left-back! Borussia Dortmund vs. Bayern Munich: Vote for YOUR Klassiker dream team left-back! Ahead of the first Bundesliga Klassiker of the season, bundesliga.com is giving you the chance to vote for your Bayern Munich-Borussia Dortmund dream team. All 11 positions are up for grabs, and it's your votes that will determine the final combined Bayern-Dortmund XI, which we will present to you ahead of Saturday's big match. 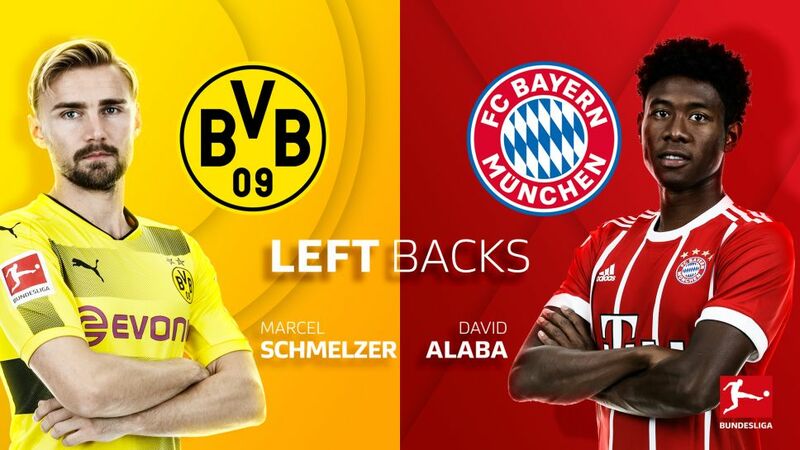 Here are the four candidates for the left-back position: David Alaba, Juan Bernat, Raphael Guerreiro and Marcel Schmelzer. Cast your votes in the poll below! Seconds after coming on for his debut against Greuther Fürth in February 2010, Alaba set up the lead goal for Franck Ribery in a DFB Cup tie. It was a scene that has since become very familiar in Germany. Regularly deployed in central midfield for his national team, the Austrian’s versatility is a major plus. Alaba was used in midfield and in a back three under Pep Guardiola but he is best known for raids down the left and combinations with the likes of Ribery. Then, of course, there is the 25-year-old’s pinpoint accuracy with a dead ball. Last season the six-time Bundesliga winner scored three goals from free-kicks. Bernat was something of a surprise signing when he was brought to Bayern by Pep Guardiola in 2014. The former Valencia player soon stood out though for the speed at which he covers ground as well as the sharpness of his dribbling skills. The 24-year-old was a regular in the side in 2014/15, when Bayern romped to the title in his first year at the club. Injuries have restricted his progress since then but Bernat’s speed and the accuracy of his passing make him an important asset. Signed midway through Euro 2016, a tournament he ended up winning with Portugal, Guerreiro enjoyed a strong first season with Dortmund. At left-back or in midfield, the French-born player regularly demonstrates impressive close control and a tenacious attitude. His pace and adaptability are impressive, as is his prowess from set pieces. The 23-year-old scored six league goals last campaign – including a thunderous strike when Dortmund visited Munich in April. A youth academy graduate, Schmelzer knows Borussia Dortmund inside out. He broke into the first team in August 2008 following Jürgen Klopp’s arrival as manager and the current club captain’s rapid development coincided with Die Schwarzgelben’s return to prominence. Schmelzer played every minute of Dortmund’s 2010/11 Bundesliga-winning campaign and was a key part of a thrilling side known for its impressive pressing off the ball and lightning-quick attacks. A dependable performer who is as well known for creating chances as trying to snuff them out, the 29-year-old was named Dortmund skipper in 2016.